A movement emerges to challenge the tightening of intellectual property law around the world. At the end of the twentieth century, intellectual property rights collided with everyday life. Expansive copyright laws and digital rights management technologies sought to shut down new forms of copying and remixing made possible by the Internet. International laws expanding patent rights threatened the lives of millions of people around the world living with HIV/AIDS by limiting their access to cheap generic medicines. For decades, governments have tightened the grip of intellectual property law at the bidding of information industries; but recently, groups have emerged around the world to challenge this wave of enclosure with a new counter-politics of "access to knowledge" or "A2K." They include software programmers who took to the streets to defeat software patents in Europe, AIDS activists who forced multinational pharmaceutical companies to permit copies of their medicines to be sold in poor countries, subsistence farmers defending their rights to food security or access to agricultural biotechnology, and college students who created a new "free culture" movement to defend the digital commons. 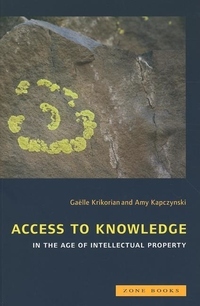 Access to Knowledge in the Age of Intellectual Property maps this emerging field of activism as a series of historical moments, strategies, and concepts. It gathers some of the most important thinkers and advocates in the field to make the stakes and strategies at play in this new domain visible and the terms of intellectual property law intelligible in their political implications around the world. A Creative Commons edition of this work will be freely available online.